Tool kits give you the convenience of everything you need wrapped into one simple package. 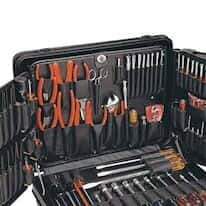 Instead of selecting each tool one by one, save time and select a tool kit that mostly likely will include a handy carrying case. Whether you are looking for screwdrivers, files, pliers, wrenches, sockets, knives and blades, probes and hooks, or telescoping inspection tools and mirrors, we offer a kit to meet your needs. Small, medium, or large piece kits are available for all of these tools.